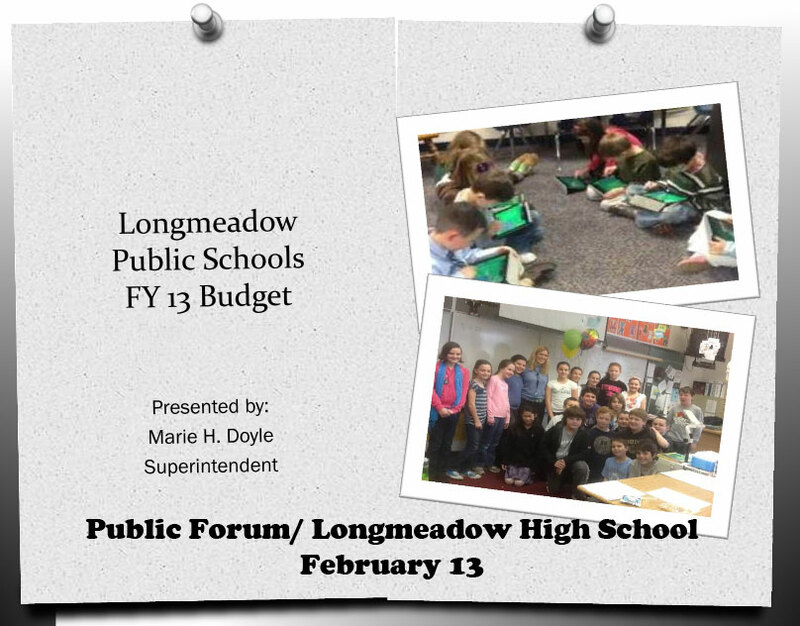 The Longmeadow School Committee held a Public Forum on February 13 meeting to present the FY2013 school department budget and to hear comments from the public. There were only 2 town residents (not counting School Dept and LCTV employees, SC members and a SB member) so I thought the information and some comments would be of interest to Buzz readers. Some questions were asked by the two town residents in attendance. I asked about the 2.6% increase in the General Fund sourcing requirements and FY2013 school department capital requests including the plan forward for IT spending. 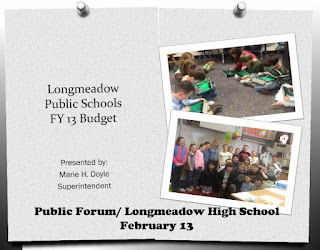 Technology implementation- both hardware and professional headcount in the Longmeadow Schools is quickly becoming a major factor in our School Department budget. A new technology capital plan has been written and is being reviewed by the School Committee members. Kevin Warenda outlined a bold lease/ purchase approach that is part of this plan and which will accelerate our move toward the state guideline ratio of 1:1 student/ computer device (see video clip below, courtesy of LCTV). There was no discussion of expected costs with this proposal. Dave Gustafson asked about the $100K reduction in utility costs, made a couple of comments including one recommending that the School Committee be careful with the rapid deployment of technology in the schools. He was concerned about the loss of critical thinking skills. I asked about any provisions in the budget for teacher salary increases and COLAs. The Longmeadow Teachers contract expires on August 31 and there is no new contract in place. 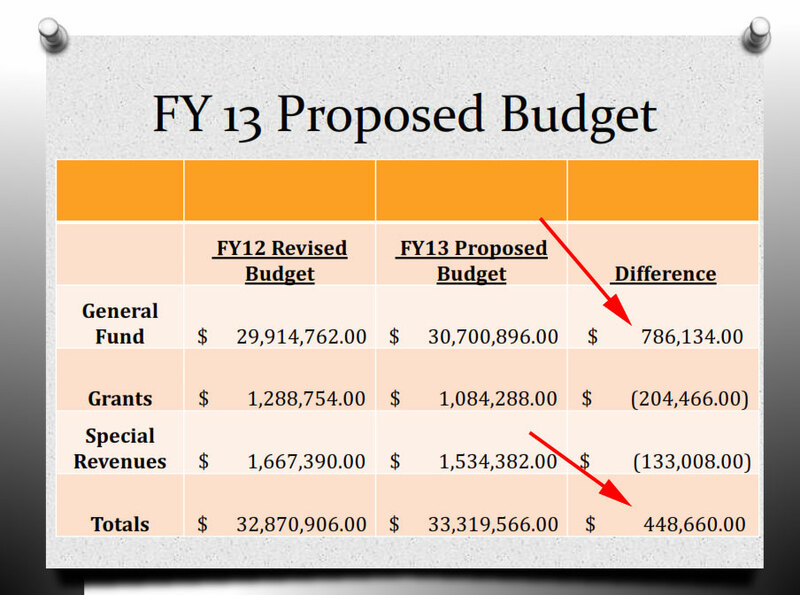 The FY2013 budget does not include COLAs for teachers. A 1% COLA for School Dept employees was estimated to cost ~$230K." Contractual Step Increases for teachers are in the FY2013 budget and total ~ $259K. Bottom line: The town's General Fund portion of the FY2013 school dept funding will increase by 2.6% or $786,134 due in part to funding reductions in Grants and Special Revenues. Through the efforts in the state legislature led by our State Representative, Brian Ashe, Longmeadow (as well as other communities) will likely be allowed to pay the unreinbursed cleanup costs from the "Halloween snowstorm" by issuing a 5 year bond at low interest rates. Estimated unreimbursed costs are $3 million dollars... so it will be an additional budget cost of ~ $600K/ year. Some members of the SB had expressed optimism that the total FY2013 budget could be held flat from last year in order to mitigate Part II of the increase in property taxes that will occur in FY2013 due to the new HS project. 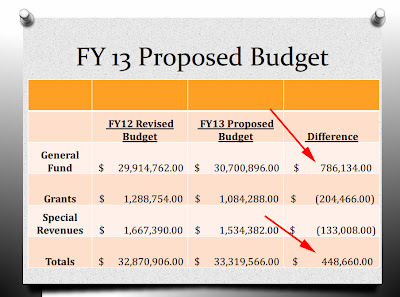 It will be interesting to see how much increase there will be with the FY2013 budget that will be presented at the ATM for approval by town voters.